Discussion in 'What Breed Or Gender is This?' started by milo2145, Jan 3, 2011. I thought this brahma mix might be a hen - but lately I am noticing a few rooish characteristics, like pecking at the ground and calling the hens over, a few suspicious hackle feathers and a very deep cluck! what do you guys think? Looks rooish to me (I think I am seeing saddle feathers)- I could be totally wrong. Beautiful bird though! I'm voting roo as well. tail feathers are looking purty! I'm seeing pointy saddle feathers too so I'd vote roo. 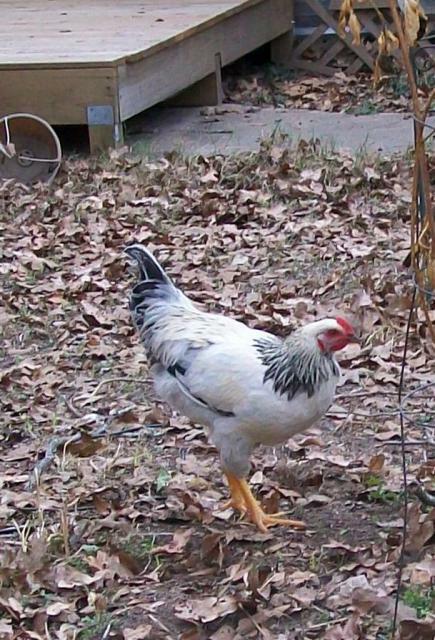 Definite rooster (I see pointy saddle feathers and big legs and feet, also your description sounds like a roo ). #2 Definite mix. has no feathered legs. Oh yeah you got a purty boy. Soon he will be anouncing his purtiness with his mighty crowing.